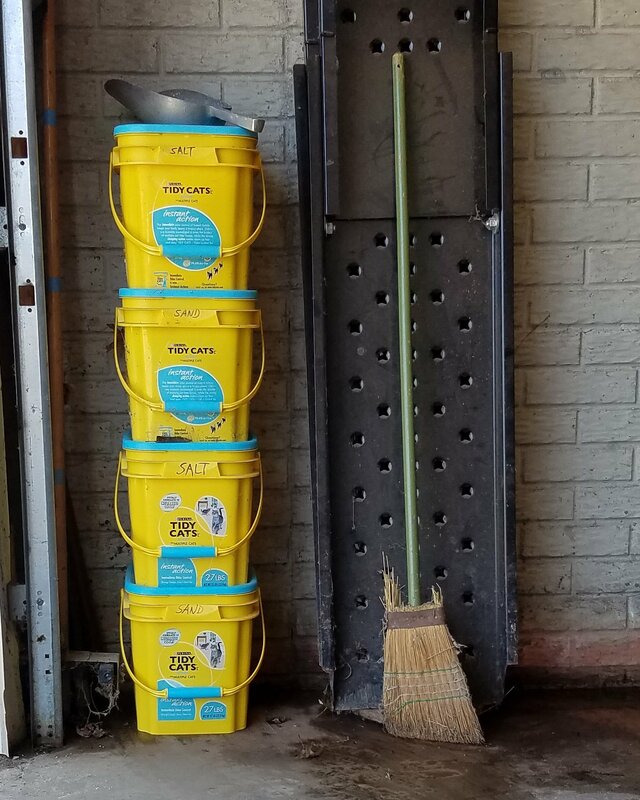 Buckets of sand and salt near the garage door. It felt good to be outdoors on Friday. The sky was clear and temperatures warmed enough to shed my coat. Green-up has begun. We filed our income taxes with the Iowa Department of Revenue and the Internal Revenue Service. Earlier in the week I paid the second half of our annual county property taxes. This morning I plan to walkabout our subdivision, inspect roads, and address concerns about water and sewer leaks. With the hard winter and significant ambient temperature swings, there is damage. Whatever needs fixing requires a plan and a budget. As a board member and trustee of our home owners association and sanitary sewer district I share responsibility for both. We’ve done our part to support government services. Now spring can begin. Outdoor work was sweeping up enough sand from the road in front of the house to refill sand buckets used last winter. I haven’t purchased sand in about five years. Because of the hard winter there was plenty available. A 50-pound bag of solar salt filled empty salt buckets. I found the fan to blow air across the damp garage floor. It took about two hours for moisture to evaporate. Baby steps to start spring 2019. Governor Kim Reynolds issued a disaster proclamation for Howard County Friday afternoon. The number of counties under disaster proclamations is now 53 (of 99), according to the press release. Current estimates of damage exceed $1.6 billion according to this morning’s Iowa City Press Citizen, although counties reported they have yet to fully assess damage within their jurisdictions. Governor Reynolds proclaimed nothing about what government would do to help mitigate the deleterious effects of climate change going forward. My farmer friend from the home, farm and auto supply store reported the ground needs drying before getting into his fields. While the weather quickly became spring-like, the usual issues for row-crop farmers remain. My specialty crop friends also found the ground too wet to work. They are planting in their hoop houses which are traditional season-extenders. Spring began Wednesday and is just getting started. We’re ready. This entry was posted in Environment, Home Life, Writing and tagged #ActOnClimate, #amwriting, climate change, environment, global warming, homelife, spring, sustainability. Bookmark the permalink.